As a teenager, I was always being lectured by mom and dad to clean my room. I hated doing it. I figured why make the bed if you are just going to sleep in it again and mess it? That was my thought process back then. It wasn’t until I became a mom and had a family of my own that I discovered why my parents were on me so much to pitch in around the house. Having a clean home feels good. Now I clean everyday and don’t mind it one bit! I’m pretty sure I can pinpoint when my view on cleaning changed to something more positive. I was a young mom and military spouse whose partner was often deployed. I felt sick with worry and dread when he would have to leave on a deployment or exercise. I didn’t know what to do to make the time pass by faster. One day I was chatting with my best friend, Angel on the phone and she told me what helps her when her hubby is away: cleaning and organizing. She said it keeps her busy and gets her mind off the fact that she is alone for an extended period of time. I took her advice and agreed with her 100%. It helped me get organized and do something productive instead of moping around and having a messy house. Since then the habits have been ingrained in me and I still enjoy a clean home. I recently had a chance to try a new to me (and new to Canada too!) 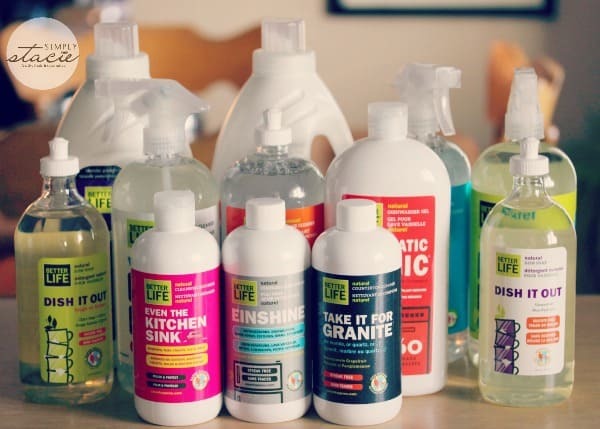 brand of cleaning products available at Target Canada stores across the country: Better Life. This is a brand whose focus is on having naturally safe and effective cleaning products that work on even your toughest messes. All their products are cruelty free, hypoallergenic, free of synthetic fragrances and dyes and free of solvents. I was looking forward to trying them out. I’m in the process of doing a deep clean before the holiday season hits. Let me tell you a little more about the specific products I tried. 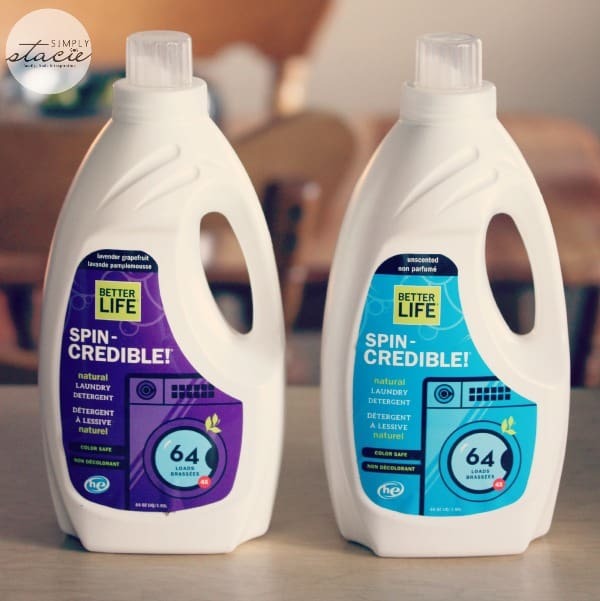 Spin Credible Laundry Detergent: This natural laundry detergent is ultra concentrated so you can do 64 loads of laundry per bottle. It works in both HE and standard washing machines and comes in two formats: Free & Clear and Lavender Grapefruit. I washed my bedding in the Lavender Grapefruit and loved how fresh and clean they smelled afterwards. what-EVER! All-Purpose Cleaner: I’ve been using this cleaner most often out of all the products I received. It cleans just about every surface and room in my home. I use it to clean and dust surfaces, clean the kitchen counters, clean the bathroom and more. It comes in Clary Sage & Citrus and Scent-Free. I Can See Clearly Wow! 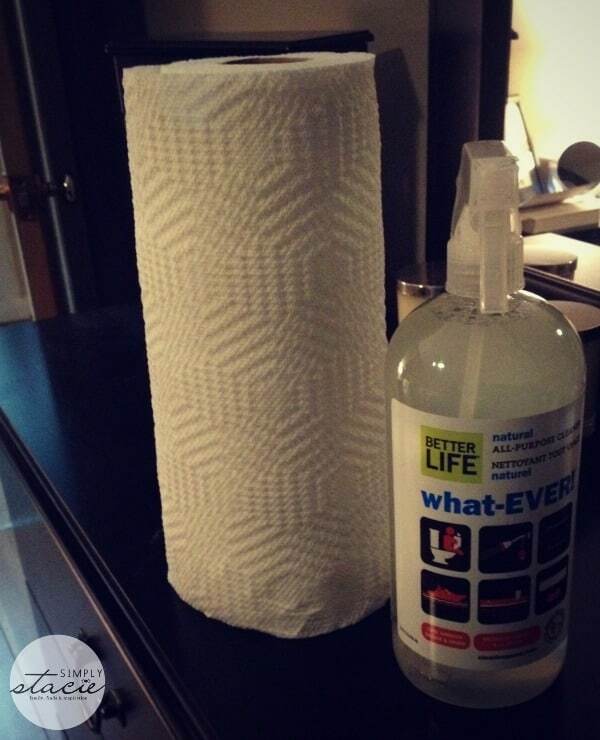 Natural Glass Cleaner: Cleans your glass and mirror leaving no streaks or film. Just spray and wipe clean. 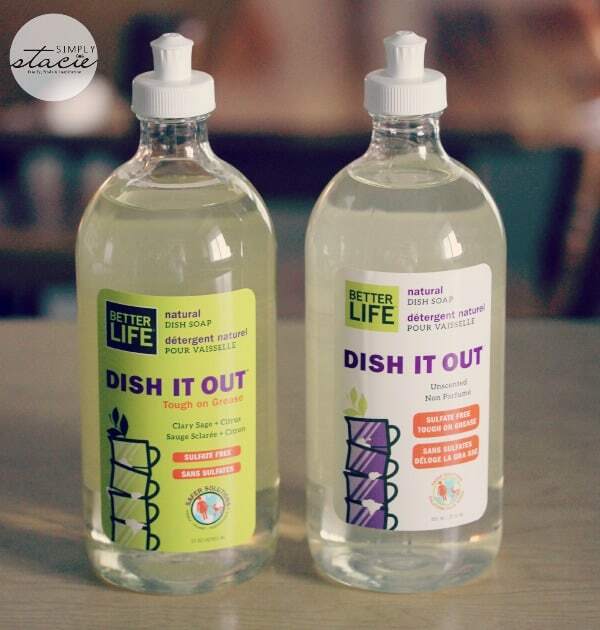 Dish It Out Natural Dish Liquid: I have a dishwasher, but still wash the large pots and pans by hand in the sink. It doesn’t give a lot of suds because it is sulfate free. However, it is tough on stuck on food and grease and cleans the dishes. I like the smell of the Clary Sage & Citrus. It also comes in Scent-Free. Even the Kitchen Sink Natural Cleansing Scrubber: Cleans just about everything with no scratching! You can use it on your kitchen sink (of course), tubs, tiles, grout, toilet, stovetops, etc. My kitchen sink needed a good cleaning and had some stuck on food. I used this product to get it shiny and clean with little “elbow grease” on my part. Take It For Granite Natural Stone and Countertop Cleaner: Clean, polish and protect your granite, marble, quartz, concrete, limestone and other high-end stone surfaces. I don’t have any in my home so I’m passing this product on to my mom to use on her granite kitchen countertops. Einshine Natural Stainless Steel Cleaner: Clean and polish your stainless steel appliances with the scent of essential oils of Lavender & Chamomile. My sister has stainless steel appliances and I’m going to get her to try it out next time I see her. Simply Floored! 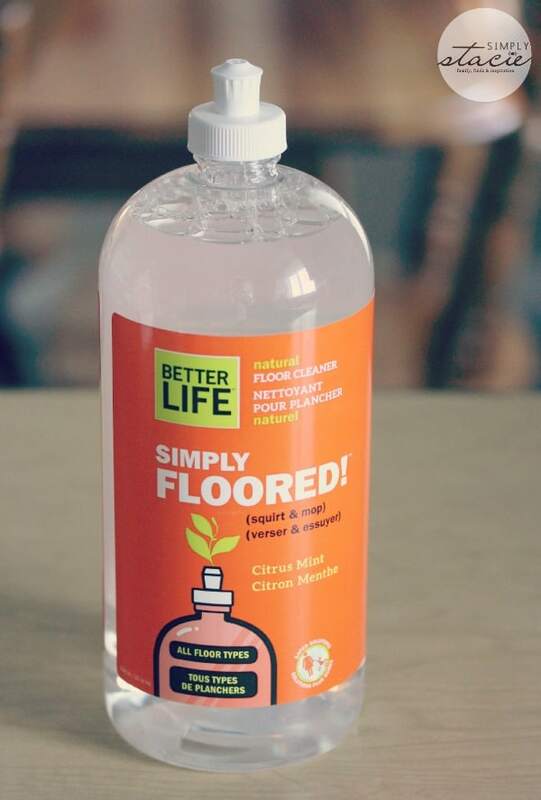 Natural Floor Cleaner: This product rocks and I love not having to cart a bucket of dirty water around the house as I mop. You just squirt the cleaner on the floor and then mop it up. Automatic Magic Dishwasher Gel: I’m very particular about the detergent I use in my dishwasher. I was nervous trying out a new brand, but was pleased to discover that it did an amazing job cleaning my dishes. 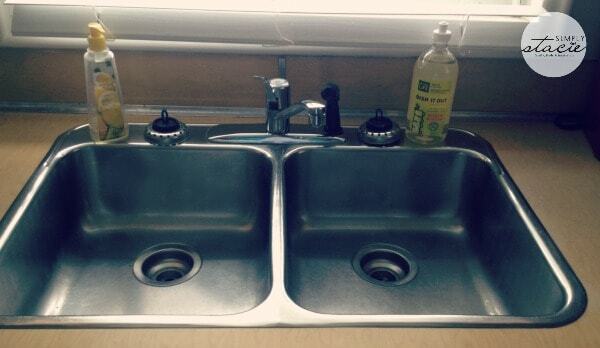 There was no residue left on the dishes, no gross film and they were sparkling clean. My 10 year old daughter often asks to help me “clean” up. I don’t mind letting her help me when we are cleaning with Better Life products because you can clean safely with kids. 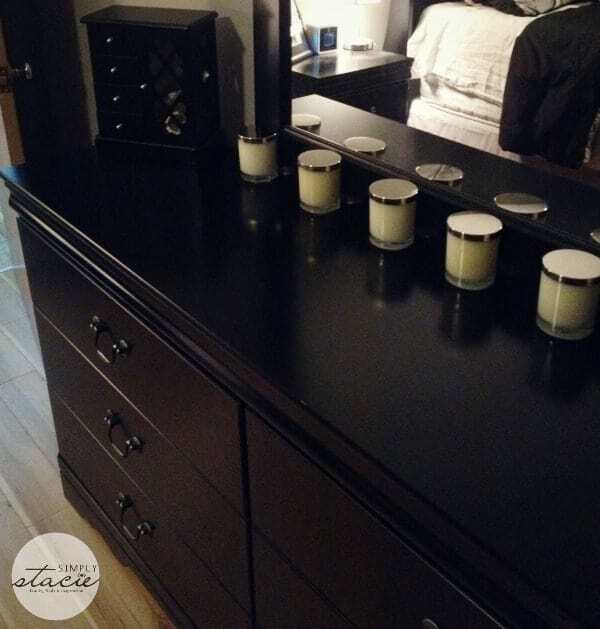 Another thing I like is that there is no overwhelming “chemical” odour when you are cleaning. I don’t have to open the bathroom window when I’m doing a deep clean. The only smell is the essential oils and it’s a pleasant one. 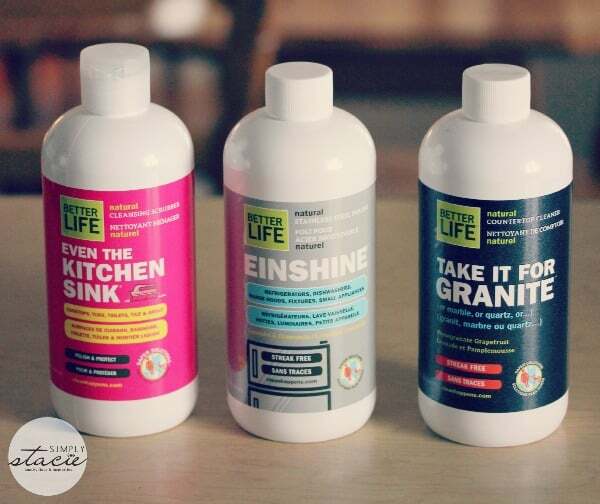 Visit Better Life for more information about their line of natural cleaning products. Have you tried Better Life products? If not, which one are you looking forward to trying out the most? Connect with Better Life on Facebook, Pinterest, Twitter, YouTube and their blog. Visited Better Life and I’m interested in trying their Spin Credible Laundry Detergent the most. The Spin Credible Laundry Detergent sounds like the product I would like to try first. The all purpose looks good…. 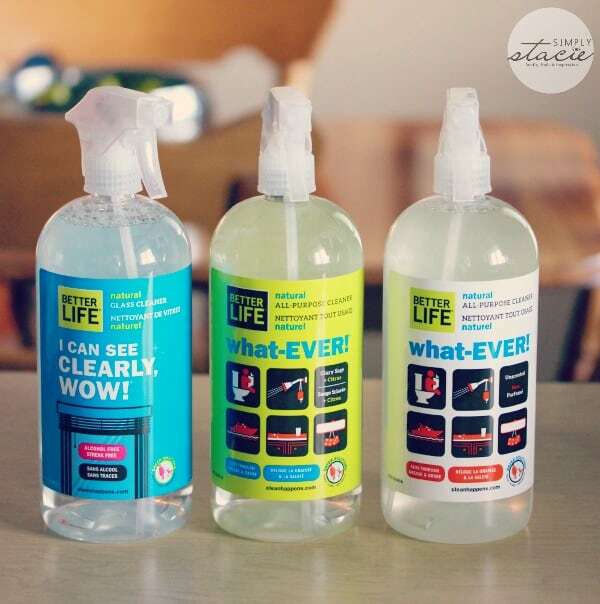 nothing life a good all purpose spray! I would like to try the All-Purpose Cleaner first. I want to try the what-ever! The all purpose cleaner, badly need it around the house. Spin Credible Laundry Detergent™ would be my first choice.